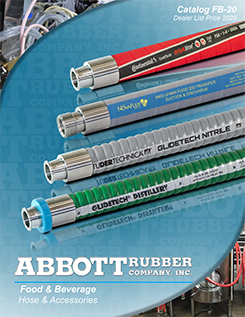 A lightweight, non-marking, flexible standard wall clear reinforced tubing for a wide variety of applications including food, beverage, air and liquids. In compliance with FDA and NSF-51. Clear reinforced PVC with Blue tint reinforced with spiral polyester. Also available in metric sizes. You may return most new, unopened items within 30 days of delivery for a full refund EXCEPT Hose assemblies (25% Restock Fee may apply). We'll also pay the return shipping costs if the return is a result of our error (you received an incorrect or defective item, etc.). © Brewers Hose & Sanitary Equipment | Abbott Rubber.